As a 79 year old bike rider, I know how much I am counting on exercise to keep my brain intact as I age. So, I was nothing less than amazed to run across the Boston University (BU) study on electrically stimulating brain function in seniors. BU brain scientist shows electrostimulation can restore a 70-year-old’s working memory to that of a 20-year-old. As you read the words stretched across this page, your brain is doing something magnificent. Each sentence lingers in your mind for a fleeting moment, the letters melding into a symphony of neural signals. These intricate electrical rhythms form the language of the brain, a language we have only begun to understand within the last century. Rob Reinhart, an assistant professor of psychological and brain sciences at Boston University, says we’ve reached a point where we not only understand this language—we can speak it and harness it to enhance the functioning of the mind. In a groundbreaking study published April 2019 in Nature Neuroscience, Reinhart and BU doctoral researcher John Nguyen demonstrate that electrostimulation can improve the working memory of people in their 70s so that their performance on memory tasks is indistinguishable from that of 20-year-olds. Eat less; move more; live longer is the mantra here. Apparently, it also leads to think better, too. The Centers for Disease Control and Prevention (CDC) seems to think so. Did you know that the health of your brain and your heart are connected? By keeping your heart healthy, you also lower your risk for brain problems such as stroke and dementia. Learn more about the connection between the heart and brain and steps to take to keep both healthy. Heart disease, stroke, and vascular dementia are preventable. Take steps to reduce your risk. Control your blood pressure. High blood pressure is a leading cause of heart disease and stroke. Over time, high blood pressure puts too much stress on blood vessels. Scientists now know that having uncontrolled high blood pressure in midlife also raises your risk for dementia later in life. Know your numbers by getting your blood pressure checked regularly. If your blood pressure is high, work with your doctor, nurse, or health care team to manage it. One way to manage your blood pressure is to take your medicines as prescribed. Learn more ways to manage blood pressure. Eat healthy foods and limit alcohol. Eat plenty of vegetables, fruits, whole grains, and low-fat dairy, and include seafood rich in omega-3 fatty acids (such as salmon) each week. Limit foods with added sugars and saturated fats, and lower your sodium (salt) intake. If you drink alcohol, drink in moderation. Drinking too much alcohol raises blood pressure, which can lead to stroke and increase the risk of some kinds of heart disease. Get diabetes under control. Diabetes causes high blood sugar, which can damage blood vessels and nerves. This damage raises the risk for heart disease, stroke, and dementia. Don’t smoke. Smoking damages blood vessels and makes blood more likely to clot, which can lead to heart disease and stroke. Smoking is the leading cause of preventable death in the United States. If you don’t smoke, don’t start. If you do smoke, learn how to quit. Stay active. Lack of physical activity can lead to high blood pressure and obesity. Most Americans don’t meet guidelines of getting at least 150 minutes of moderate-intensity exercise each week. Find ways to get your heart pumping for at least 150 minutes per week. Take the stairs, schedule a walk at lunch, or do jumping jacks during commercial breaks. Learn more about how to get enough physical activity. Since I had that nice infographic on the brain yesterday, I thought this one on brain function might be a useful follow-up. I love this infographic of the brain. Surprisingly, they left out one of the most impressive facts to me, namely, that the brain burns 20 to 25 percent of our daily calories. Bigger than any single muscle. Before you go, please check out my Page – Important facts about your brain (and exercise benefits) for a lot more details on this major organ in our body. Time flies when you’re having fun. As an old timer, I have responded countless times that “Time flies even when you’re not having fun.” So I was most gratified to find this research on exactly that. A Duke University researcher has a new explanation for why those endless days of childhood seemed to last so much longer than they do now–physics. I have spent a lot of time writing about the benefits of exercise for the brain as well as the body. Herewith info from the Tufts Health and Nutrition Letter on what I can only call food for thought. Currently available medical treatments for age-related cognitive decline and Alzheimer’s disease have had limited success. Adopting a healthy diet and lifestyle has been among the most consistent recommendations to maintain brain health over the long term. Some studies have linked an overall healthy dietary pattern to less chance of experiencing age-related decline in memory and other cognitive skills. The specifics of “brain protective” diets vary, but tend to have certain elements in common. Dietary patterns associated with lower risk of age-related cognitive decline and dementia are higher in non-starchy vegetables, fruits, whole grains, nuts, legumes and seafood while limited in red and/or processed meats, sugar-sweetened foods and drinks, refined grains and added salt. But there have been few long-term trials testing overall dietary patterns for protecting the aging brain. Researchers at Rush University Medical Center in Chicago and the Harvard T.H. Chan School of Public Health are currently conducting a clinical trial of a diet specifically optimized for brain health and mild weight loss—the Mediterranean-DASH Intervention for Neurodegenerative Delay (MIND) diet. In the nearly 10 years of writing this blog I have come to believe that use it or lose it is an unassailable law of the body. And what applies to the body often carries over to the brain. As I have mentioned previously, my family has dementia in general and Alzheimer’s in particular on both sides, so keeping a clear head really resonates with me. My dog and me out for a ride. I am a little past middle age in the picture, but you get the idea. I really wanted to reproduce this just because the illusion seemed so cool to me. I don’t know that you can benefit from in any way, but to enjoy it. Follow the directions in the caption – and enjoy. Summary: Researchers report the same subset of neurons encode actual and illusory flow motion, supporting the concept Jan Purkinje proposed 150 years ago, that “illusions contain visual truth”.Source: SfN. Fixate the black dot and move your head towards and away from the image and you should perceive the rings rotating. NeuroscienceNews.com image is credited to Junxiang Luo. The Pinna-Brelstaff figure is a static image of rings that appear to rotate clockwise as one moves toward and counterclockwise as one moves away from the figure. Having previously identified particular parts of the human brain that represent the Pinna illusion, Junxiang Luo and colleagues at the Institute of Neuroscience, Chinese Academy of Sciences first confirmed that male rhesus macaques likely perceive the illusion similarly to people. The researchers then recorded activity from individual neurons in the previously identified brain regions, and discovered cells that signal the illusory motion similarly to actual motion. A delay of about 15 milliseconds enables the brain to register the illusory motion as if it was real. This study provides new insights into how the brain grapples with the continual mismatch between perception and reality. A blood test for a protein could identify people in the early stages of Alzheimer’s disease a decade or more before symptoms, such as a decline in memory and thinking, emerge, as reported in Medical News Today. This was what an international group of scientists concluded after evaluating the simple test that used blood samples from people with a rare form of Alzheimer’s disease that they had inherited. The team included researchers from Washington University School of Medicine in St. Louis, MO and the German Center for Neurodegenerative Diseases in Tübingen, Germany. The test looks for changes in levels of the neurofilament light chain (NfL) protein. The protein normally resides inside brain cells, or neurons, as part of their internal skeleton. Summary: A neuroimaging study reveals the effects of social exclusion in the left inferior frontal gyrus. The study found social exclusion can spur extremist behaviors in people who are most vulnerable to radicalization. Source: Universitat Autònoma de Barcelona. A study led by researchers from the Universitat Autònoma de Barcelona (UAB) and the Hospital del Mar Medical Research Institute (IMIM), in collaboration with other international institutions, explored the neural and behavioral relationships between sacred values, violent extremism and social exclusion in a group of young Moroccan men living and schooled in Catalonia and vulnerable to radicalization. A study conducted by the UAB and IMIM used neuroimaging techniques to show that social exclusion increases the number of ideological and group values worth fighting and dying for in populations vulnerable to radicalisation. The study focused on neural activity in a region of the brain related to rule retrieval and sacred values. NeuroscienceNews.com image is in the public domain.Sacred values are those perceived as non-negotiable, those which must be upheld at all costs. They also contain an identity component related to perceiving the person as a member of their reference group. The number of people living with dementia globally more than doubled between 1990 and 2016 from 20.2 million to 43.8 million, prompting researchers to call for more preventative action. A new paper published in The Lancet Neurology also found that 22.3 per cent of healthy years lost due to dementia in 2016 were due to modifiable risk factors. Prepared by academics across multiple institutions and led by the University of Melbourne and the University of Washington, the paper looked at the global, regional and national burden of Alzheimer’s Disease and other dementias from 1990-2016. The systematic analysis of the Global Burden of Disease Study 2016 found dementia was more common at older ages, with the prevalence doubling every five years over age 50. There was also significant potential for prevention. “In our study, 22.3 per cent (11.8 – 35.1 per cent) of the total global disability-adjusted life years lost due to dementia in 2016 could be attributed to the four modifiable risk factors – being overweight, high blood sugar, consuming a lot of sugar sweetened beverages and smoking,” the authors said. Eat less; move more; live longer remains the mantra of this blog. It is good to learn from Harvard, no less, that moving more also helps to keep our brain intact and functioning. There are plenty of good reasons to be physically active. Big ones include reducing the odds of developing heart disease, stroke, and diabetes. Maybe you want to lose weight, lower your blood pressure, prevent depression, or just look better. Here’s another one, which especially applies to those of us (including me) experiencing the brain fog that comes with age: exercise changes the brain in ways that protect memory and thinking skills. In a study done at the University of British Columbia, researchers found that regular aerobic exercise, the kind that gets your heart and your sweat glands pumping, appears to boost the size of the hippocampus, the brain area involved in verbal memory and learning. Resistance training, balance and muscle toning exercises did not have the same results. Getting the heart pumping with aerobic exercise, like walking or cycling for 35 minutes three times a week, may improve thinking skills in older adults with cognitive impairments, according to a study published in the December 19, 2018, online issue of Neurology®, the medical journal of the American Academy of Neurology. After six months of exercise, study participants’ scores on thinking tests improved by the equivalent of reversing nearly nine years of aging. The study looked at people who had cognitive impairments without dementia, which is defined as having difficulty concentrating, making decisions, or remembering, but not severe enough to be diagnosed with dementia. Merry Christmas and Season’s Greetings! 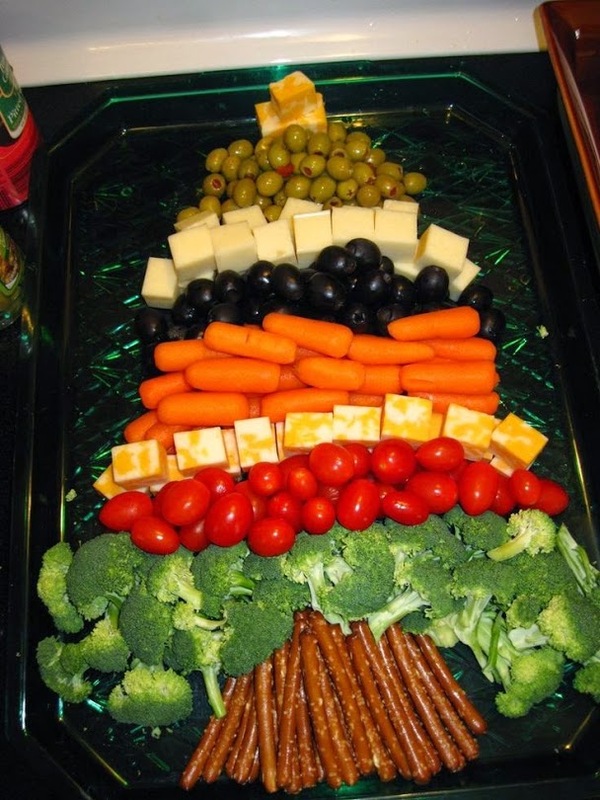 I hope this edible Christmas tree will give you healthy ideas about your eating this holiday season and in the coming year. While you are thinking about it, don’t forget that you need to exercise, too. You won’t be exercising just to burn calories. Exercise benefits your brain and body in many ways. Check out the exercise tags at the right to read further on this. I hope you will enjoy all the benefits of good food and exercise! Eat less; move more; live longer. Healthy eating is healthy aging and we all want that. Okay, we seniors are more aware of it than you younger folk, but keep at it and you will come realize and appreciate it too. Best wishes for this holiday season! Regular readers know that I am a senior citizen, turning 79 next month. My family has a history of dementia in general and Alzheimer’s Disease in particular. SO, I am interested in anything that affects the brain and relates to brain function. This study at the University of Waterloo captured my attention. Researchers report older adults who take up drawing are better able to retain new information than those who write notes.Source: University of Waterloo. Older adults who take up drawing could enhance their memory, according to a new study. As part of a series of studies, the researchers asked both young people and older adults to do a variety of memory-encoding techniques and then tested their recall. NeuroscienceNews.com image is in the public domain.